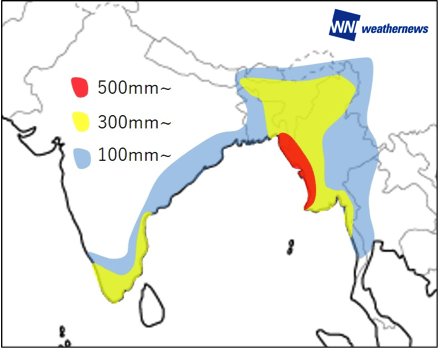 Tropical Depression is Expected to Bring Damaging Rain to Southern India on May 17th – Weathernews Inc.
Weathernews Inc. (Headquarters:Chiba City, Japan, CEO: Chihito Kusabiraki, 4825:JP) announces the outlook for a potential tropical cyclone and forecasted impacts across the coastlines of the Bay of Bengal. 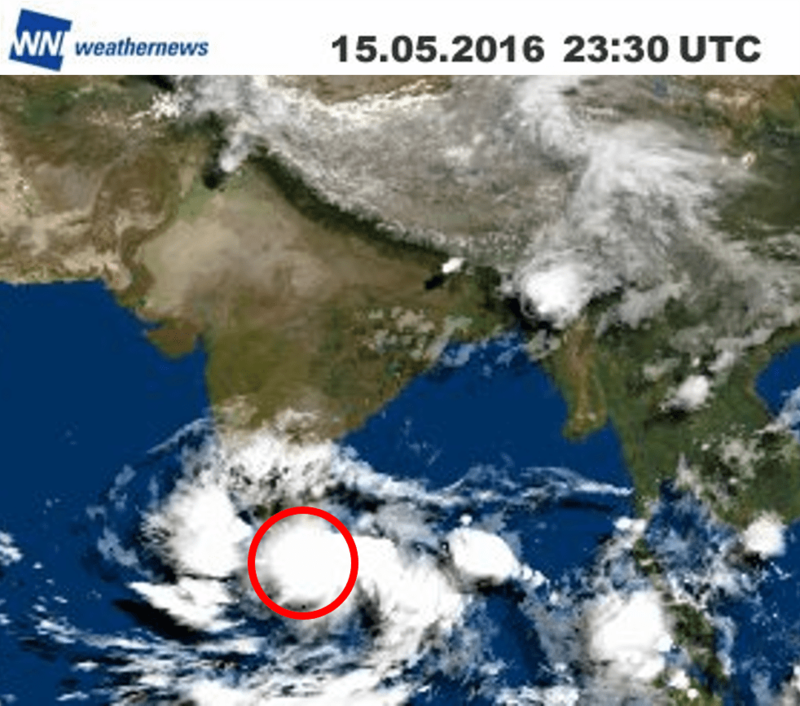 Active convection in the southern Bay of Bengal has organized into a tropical depression. The system is intensifying as it approaches southern India, where it is expected to bring extreme rainfall amounts. The system produced 285mm/24H of rain over Colombo when it made landfall over Sri Lanka on May 15th 0300UTC. The system is expected to bring damaging rains to southern India, Bangladesh and Myanmar. Caution is urged. The tropical depression is forecast to produce up to 300-400mm of rain as it moves north northwestward. This is about 8 times more than the average total rainfall for May (See Fig. 2). Chennai experienced major flooding in November and December of 2015, caused by rainfall rates of 300mm in 24 hours, once in 100 years event. The latest indications are that this tropical system could produce the same or more precipitation. Flooding and landslides may occur. Tropical storm force winds and tidal waves are expected along the coast, affecting the transportation systems. Please keep watching for the latest information. 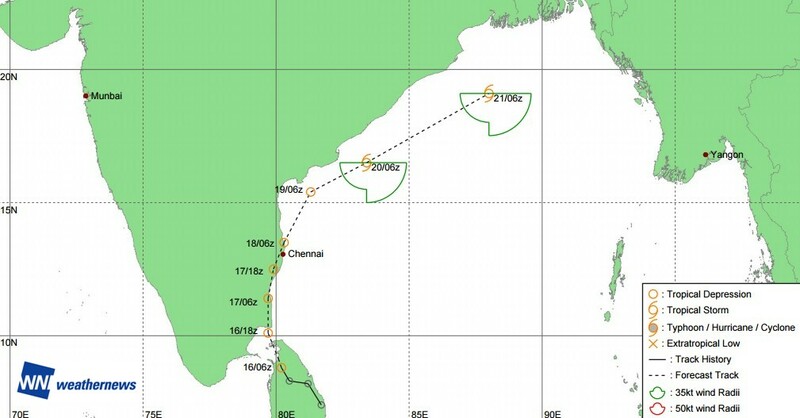 Around May 18th, the tropical depression is expected to strengthen as it moves northeastward in the Bay of Bengal after skirting the coast of southern India. It is forecast to bring up to 500mm of rain to Assam, Bangladesh and Myanmar, which may trigger secondary disasters. In other words, in the space of a couple of days, the people in those regions will experience rainfall amounts equal to the rainfall for the entire month of May in an average year. Please pay attention to the latest information. * Please follow the information of the local meteorological agency for warnings and emergency information.